No I have not been there. 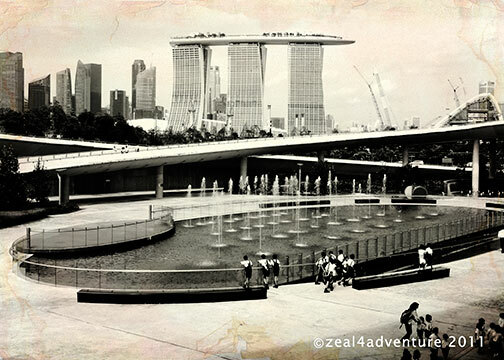 My trip to Singapore was mostly business with free time so limited; I opted to visit it some other time. I vowed to return to the bustling multicultural land of hawker food and chili crabs to do more exploring, hopefully soon. More than the street food and the famous crab dish, Singapore has of late been in the spotlight for its fine cuisine and celebrity chef restaurants, and there are 7 at the Marina Bay Sands. Fast becoming a unique icon, the MBS, which from afar looked to me like 3 towers with a cruise ship perched atop, is actually 3 cascading hotel towers connected by a skypark platform at the top. I heard that the view is incredible at the platform. Built and operated by the US gaming giant Las Vegas Sands, the entire entertainment complex obviously is centered on the casino, the 2nd integrated resort (or the IR) since Singapore gave the go signal for casino gambling in 2005. But even if I have no interest in gambling whatsoever, the world-class restaurants and perhaps its famous infinity pool are good reason to go visit. Nice shot, i recently had to cancel my backpacking trip to Singapore but sure will try to see this place when i next visit.